Need to get a job done quickly? 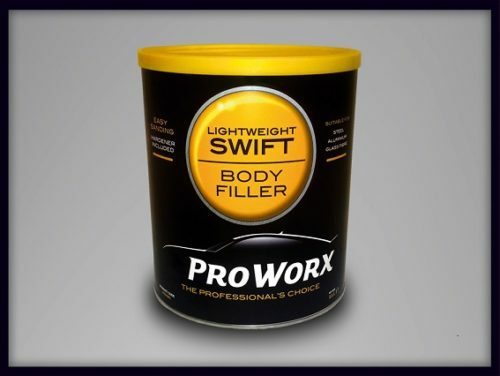 ProWorx® Swift is just the body filler you need thanks to its superb easy shaping and sanding qualities! 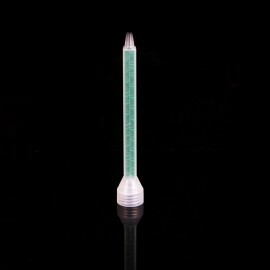 This is a high-performance body filler, perfect for the filling of large repairs and manufactured specifically for simplified application and contouring. 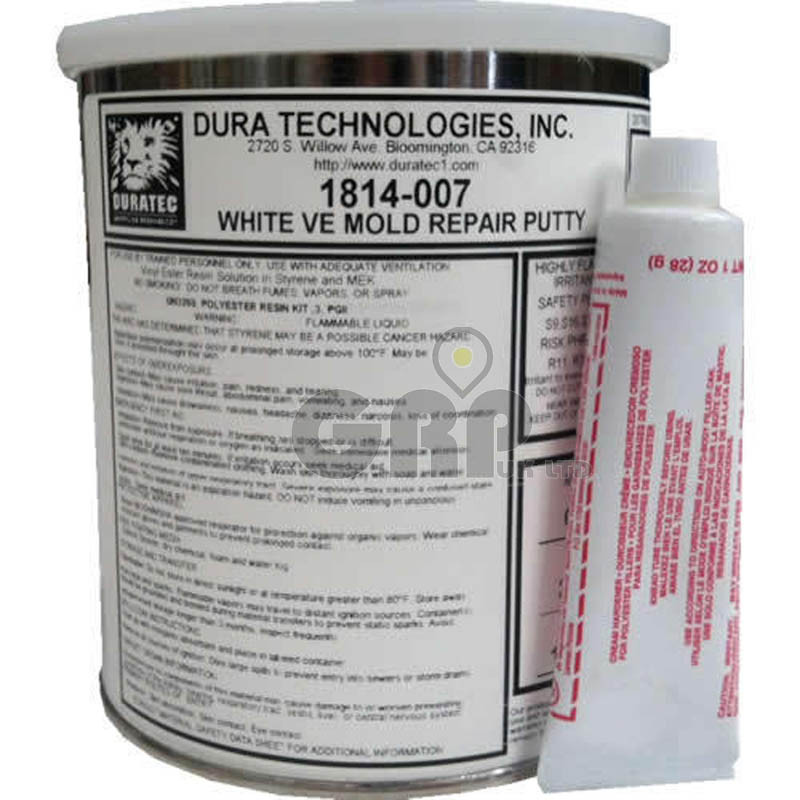 Ideal for professional use during the repair of surface damage and imperfections. Swift body filler has excellent lightweight qualities and is designed for high build & low effort sanding. 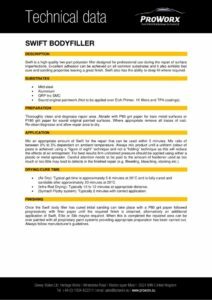 This product’s excellent adhesion properties can be achieved on all common substrates and has the duel ability to deep fill where required. Once cured initial sanding can take place with P80 grit sandpaper, followed by progressively finer grades until the required shape and finish is obtained. This product delivers top class professional standard crash repair results time after time. (Not to be applied over Etch Primer, 1K fillers and TPA coatings). Swift is an extra smooth textured product. 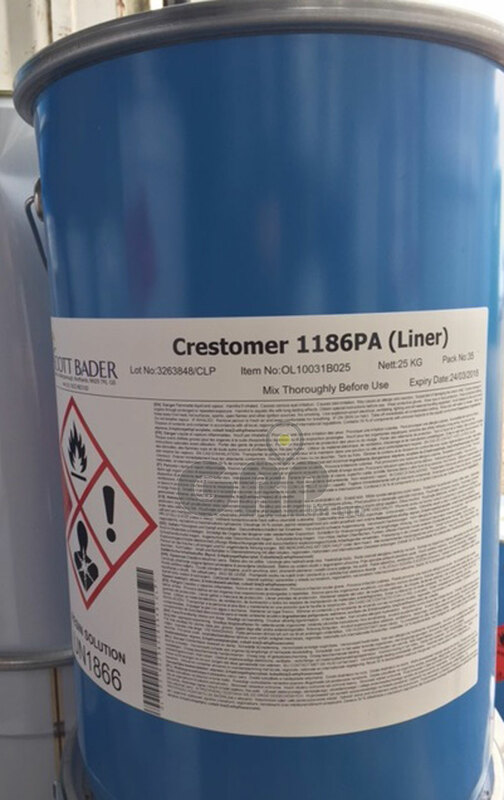 It is perfect for large repair surfaces due to its excellent adhesion qualities, as well as having the versatility to deliver optimum results for small panel damage and minor blemishes. 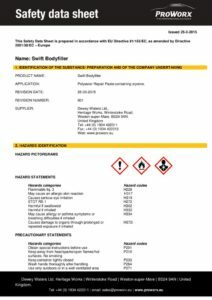 Furthermore, the product is also compatible with the latest curing processes. Curing time can be accelerated with the use of infra-red drying systems which is perfect for workshop scenarios where quick turnaround time is required. This product is also ideal for DIY home repairs due to its simplistic application and minimum effort workability. These easy shaping qualities make it perfect for both enthusiasts and professional repair undertakings. A plastic flat front edged applicator and hardener comes with each tin of Swift. (Air Dry): Typical gel time is approximately 5-6 minutes at 20 ºC and is fully cured and sandable after approximately 20 minutes at 20 ºC. (Infra-Red Drying): Typically, 10 to 12 minutes at appropriate distance. (Symach Flydry system): Typically, 2 minutes with correct application.